At the White House Correspondents' Dinner on Saturday night, President Barack Obama joked that Hillary Clinton "won't stop drunk-texting me from Cartagena." "Despite many obstacles, much has changed during my time in office," the president said at the annual event. "Four years ago, I was locked in a brutal primary battle with Hillary Clinton. Four years later she won't stop drunk-texting me from Cartegana." 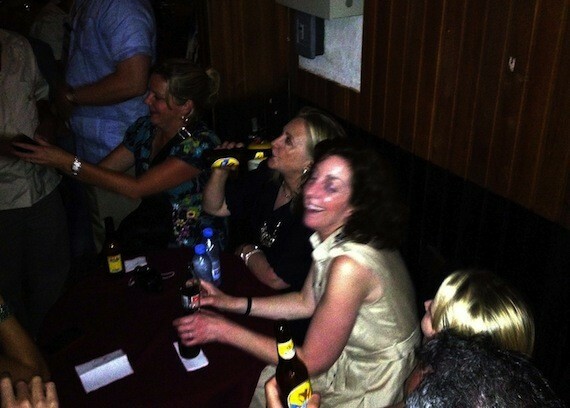 Earlier this month, Clinton was captured on camera drinking a beer in Cartagena, Colombia, where she traveled to attend the Summit of the Americas. It was just before the trip that a striking photo of the secretary of state texting aboard a military C-17 plane on her way to Libya gave way to "Texts from Hillary" -- an Internet meme sensation. Click here to check out "Texts from Hillary." Below, a photo of Clinton in Cartagena, Colombia.